If you spend any time around women's retreats or conferences, you will know that the most frequent compliment women pay to a young speaker is, "She's the next Beth Moore." What they mean is that they believe the speaker is gifted, and that is a kind thing to express. But I confess that I hope there will not be another Beth Moore (but not for the reasons you think!). I pray that every community and church and living room would be so populated with women championing Bible literacy that our eyes would cease wandering the horizon for the next big thing. I spent the past year teaching through Exodus. It was with no small amount of intimidation that I wrote and taught the portion covering the construction of the tabernacle. Any woman who knows anything about women's Bible study knows the definitive work on the tabernacle was done by Beth Moore. It was her first study, and it was also the first study I ever participated in. Having just traded my career for new motherhood, I signed up for a summer Bible study at my church, desperate to get out of the house. I had never heard a woman teach like that. Not ever. Like thousands of other women, I felt awakening in me a compulsion to know this God who reveals Himself to those who earnestly seek Him in the pages of Scripture. I was hooked. Eventually I began writing and teaching my own studies, always mindful of the debt I and so many others owe her. So when I began writing the tabernacle portion of my own study, I got down my old copy of A Woman's Heart, God's Dwelling Place for the first time in years. As much as anything else, I wanted to avoid unintentionally plagiarizing, but I also wanted to be reminded of the reverent approach Beth had brought to the teaching. Re-reading her words, as well as the clumsy answers scrawled in the blanks by a sleep-deprived new mom, brought back the memory of that newborn urgency I had felt seventeen years ago—that sense of my deep need to know the Bible better, that sense that I was able, and that someone (a woman!) was finally showing me how. That urgency never left me. The longer I teach, the more convinced I become that Bible literacy must be reclaimed among the body of believers, specifically among women. We don't know our Bibles like we should—if there is one thing that keeps me up at night, that's it. Most days I know I'm not alone in my conviction, but I imagine that two decades ago there were many days Beth Moore felt like she was. I imagine there were many days she felt like she was shouting into the wind. And that's why I pray there will never be another Beth Moore. I pray that the field of equipped women teachers will never again be as vacant as it was when she burst onto it with her Texas-sized hair and her preacher-sized passion. I pray that every community and church and living room would be so populated with women championing Bible literacy that our eyes would cease wandering the horizon for the next big thing. 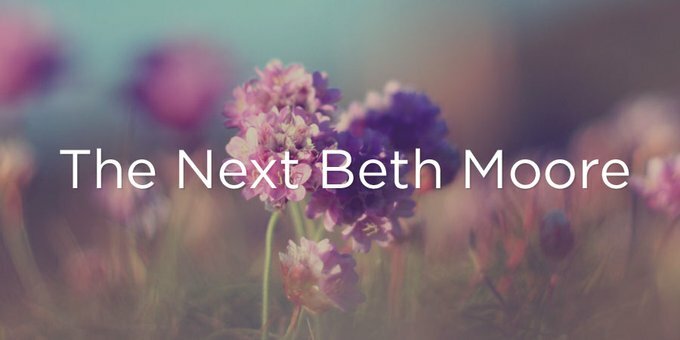 Like Moses handing over the instructions for the tabernacle to the able hands of the builders, I pray that Beth's faithful instruction would result in many able literacy-builders, eagerly constructing a meeting place between God and women in the pages of His Word. I pray that her work would bear so much fruit that she would teach herself into obsolescence. I pray no less for myself. Let the cry for Bible literacy be raised not through the amplification of a single voice, but through the harmonization of many voices—each with her own style of teaching, her own contribution to make. Do you teach the Bible? Work tirelessly to eliminate the possibility of another Beth Moore. Sisters, don't look to replace her voice; look to replicate her vision. Let us commit that no one voice will ever again be as loud because the need will never again be as great. Let the cry for Bible literacy be raised not through the amplification of a single voice, but through the harmonization of many voices—each with her own style of teaching, her own contribution to make. I am not the Next Beth Moore. I hope you aren't either. May Christian women know such bounty of sound female instruction that the Next Beth Moore need never arise. Jen Wilkin is a speaker, writer, and teacher of women’s Bible studies in Dallas, Texas. She and her family are members of The Village Church where she currently serves on staff. Jen writes and teaches the Flower Mound Women’s Bible Study, a 700-member interdenominational Bible study. Jen’s passion is to see women become articulate, committed followers of Christ, with a clear understanding of why they believe what they believe, grounded in the Word of God.